One size fits all, flexible flesh-tone and white natural-looking teeth. Prosthetic teeth fit most adults and teens ages 15 and up. 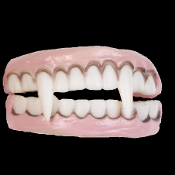 Full size set of upper and lower dentures. Re-useable. Made of soft, safe material, they are flexible, comfortable to wear and can be used over and over. 1) Rinse off teeth with warm sopay water. 2) To determine which teeth are top or bottom, look for the letter ''T'' or ''B'' molded into the gum. 3) Insert teeth to check for fit. If necessary, use scissors to trim gum line or shorten either end. BE CAREFUL - trim only a little bit at a time until satisfied with fit. 4) Teeth do not require adhesive. However, a commercial dental adhesive may be used. Make certain Monster Teeth and your own teeth are DRY. Apply adhesive to inside walls of Vampire Teeth and insert into mouth. Vampire Teeth adhere to your gums, not your teeth.